Outdoor Great Rooms: spaces that incorporate cooking, dining, and gathering components. They are now the most popular amenities for any home! Fire features are usually the centerpiece for multi-functional spaces. 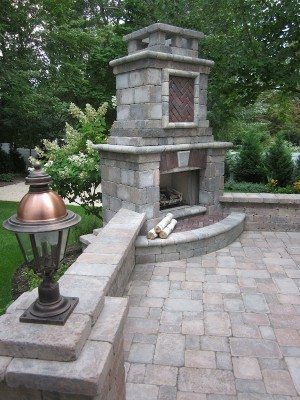 Just like building a fireplace in your living room, it also sets the ambiance for outdoor spaces too. Fireplaces can be wood burning or natural gas. Wood burning units give clients the natural aromas and the “crackle and pop” of wood while gas units are a clean alternative that can be turned on and off with the click of a button. Our fireplaces can be built out of an array of materials and come in multiple sizes and styles. Fire places make it possible for you to spend your evenings outside during the summer by adding the warm glow of a fire, as well as extending your outdoor season into the fall and winter months.